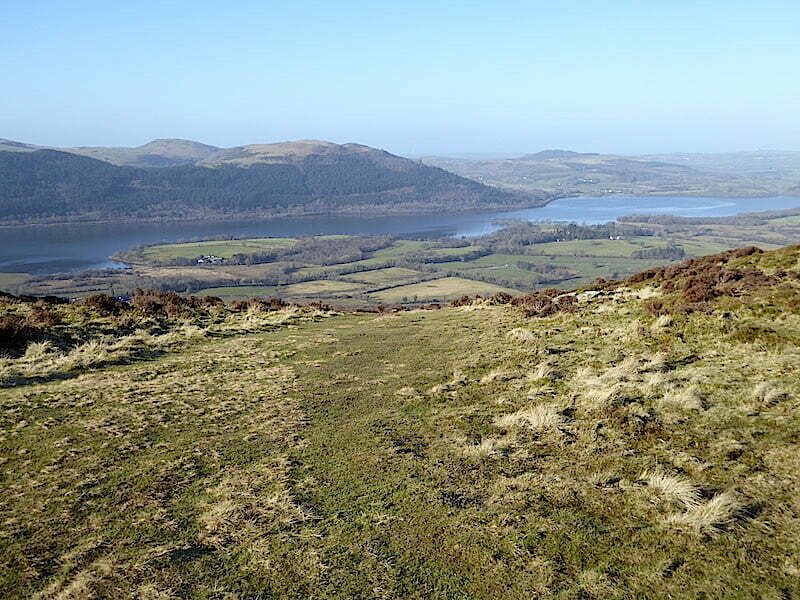 A good weather day came along so we decided to walk up to Ullock Pike and then over to its neighbouring fells across Longside Edge. Our last walk over there was in 2015 so a return visit was long overdue. The morning sun was very bright and directly in our eyes as we made our way up but, unlike our last visit, there was hardly any wind which made the climb much less of a battle. Having said that I generally felt a bit below par today and it seemed as though I was running on an energy tank which was only a quarter full. No real reason for it that I could think of, no cold, no ‘flu, no symptoms of coming down with anything, no back niggles, so just one of those low energy level days I suppose. 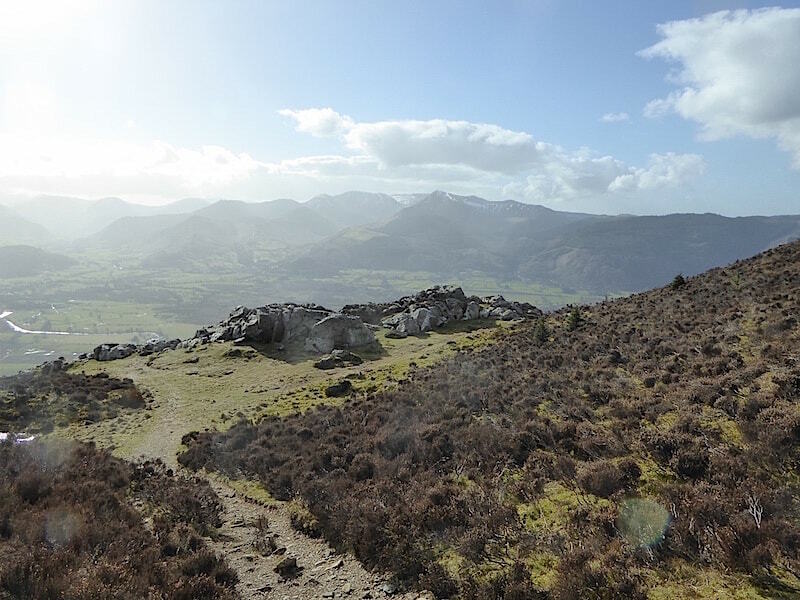 It wasn’t too good a day for views either and the combination of strong sunlight, cloud and haze meant that shots of the views toward the north western fells were simply not worth bothering with, which is a shame because on a crisp, clear day they are quite splendid. 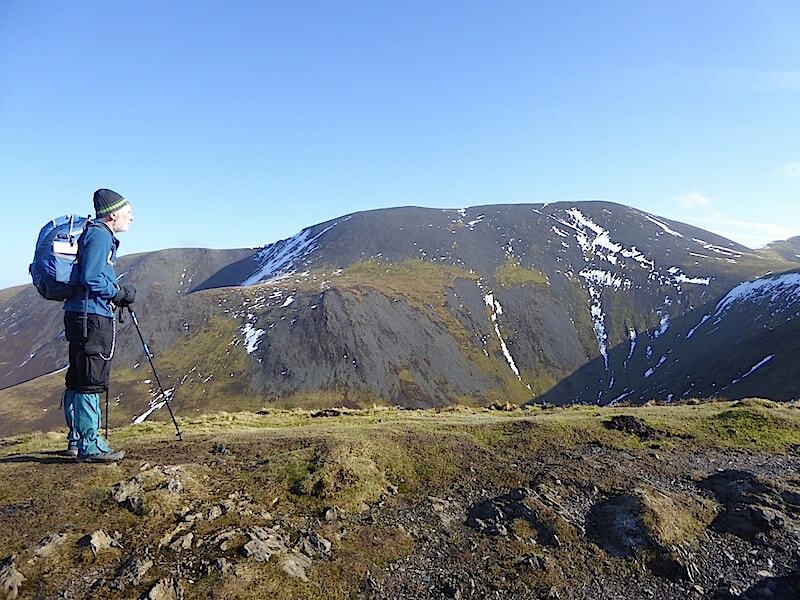 We had a mix of underfoot conditions during the walk, very muddy, wet and puddly, dry and firm, and deep snow still frozen solid, all of which were mostly avoidable so the microspikes remained in our packs. 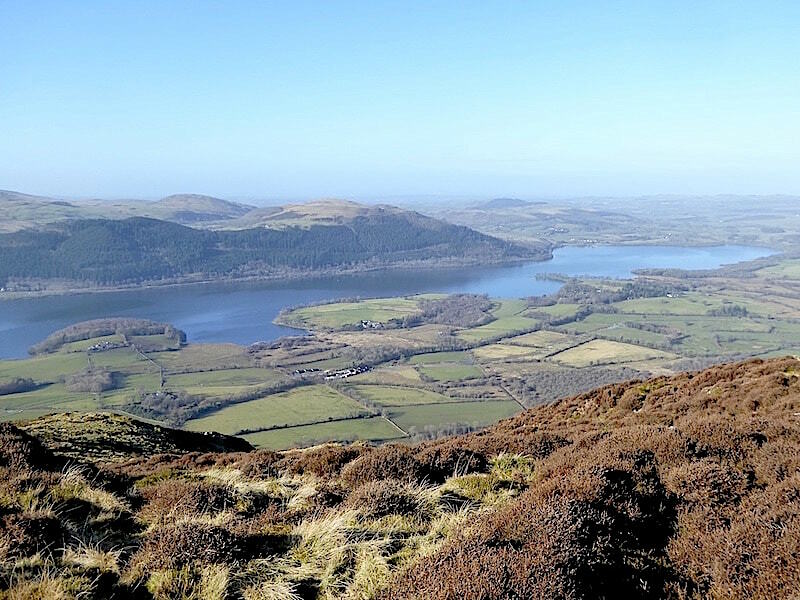 A591 lay-by below Ravenstone Manor Hotel – Ullock Pike – Long Side – Carl Side – Long Doors – Dodd – Skill Beck forest road – Sandbeds Gill trail back to the lay-by. 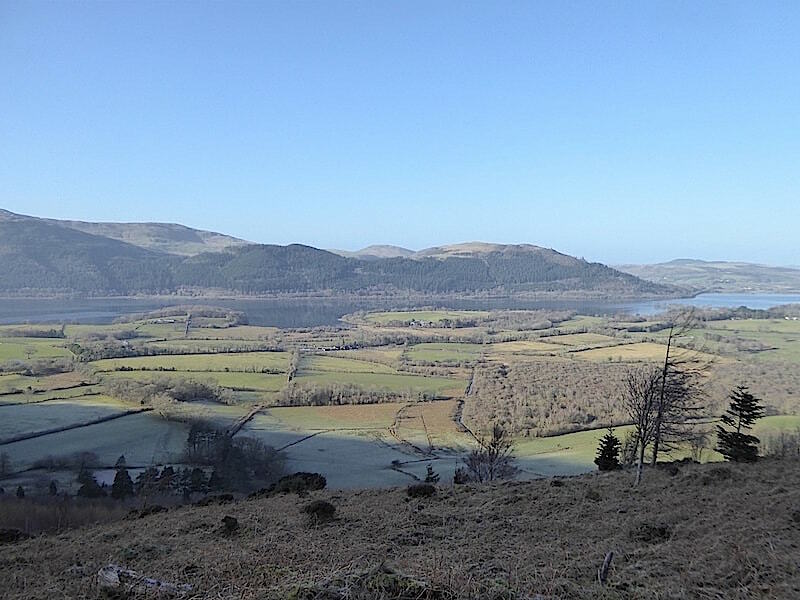 From the lay-by we walk through the gate along the muddy forest track below Ullock Pike towards the Ravenstone Manor Hotel where …..
….. the path turns steeply upwards through the Rabbit Warren plantation alongside the boundary fence. 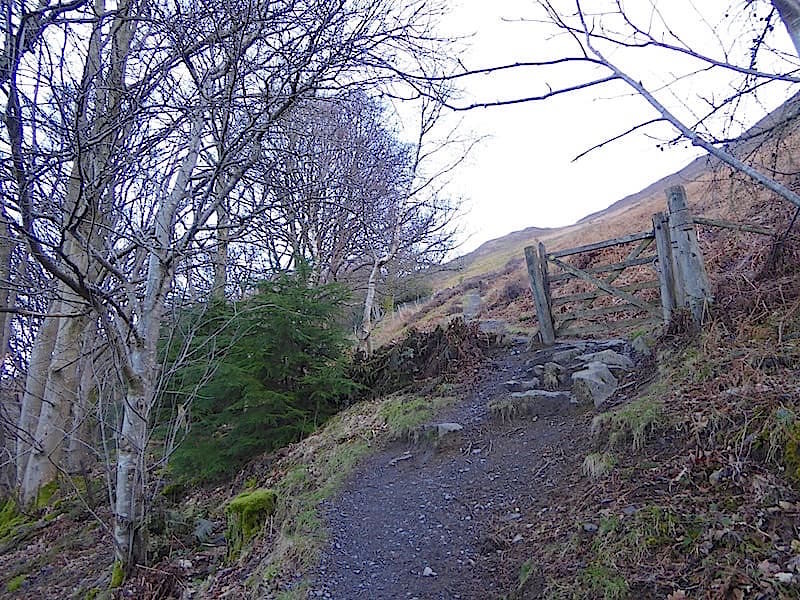 Once through the gate at the top of the path we reach the open fellside. A look back down the path while I wait for a gps problem to be dealt with, so far its telling us we have walked eleven metres. ???? 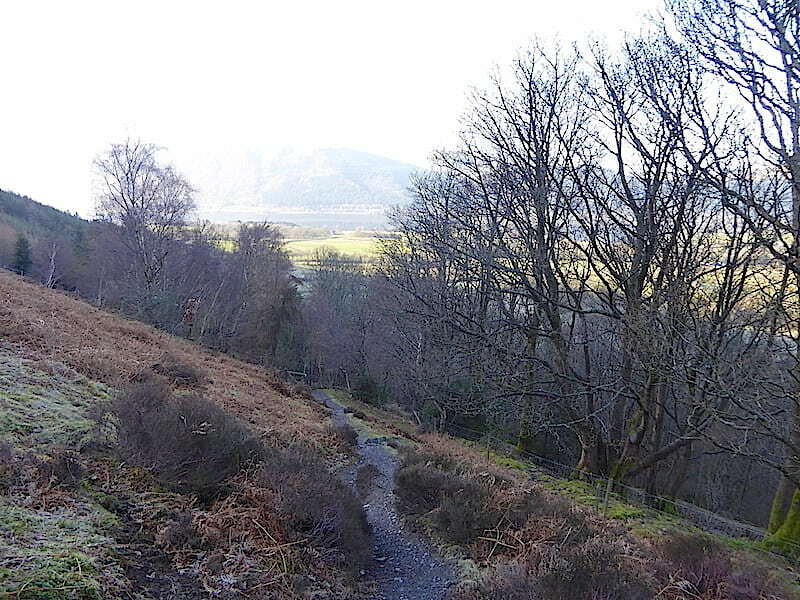 A couple of adjustments later and we continue once more up the path rising alongside Dyke Nook plantation. 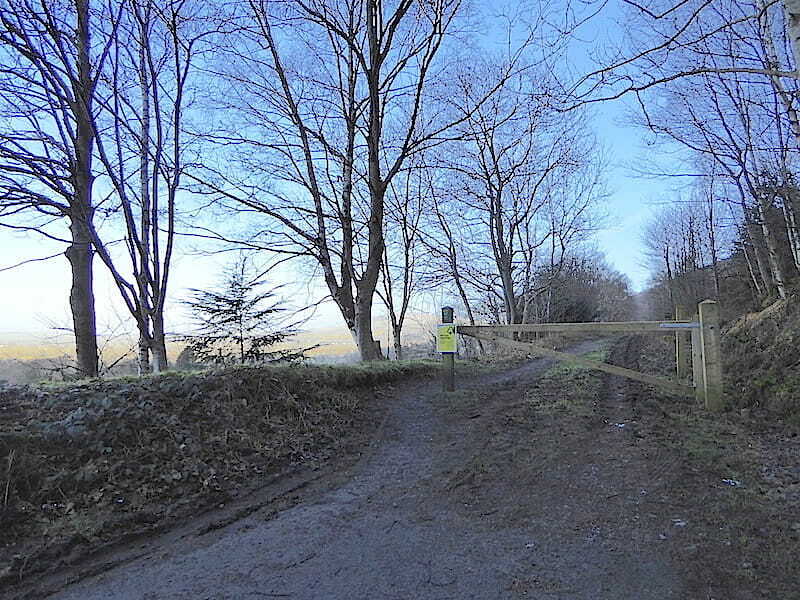 We make another stop at a fence corner above Dyke Nook. The gps is still playing up so the executive director decides to do a re-set. Meanwhile I take the opportunity to remove my jacket having worked up a head of steam on the climb to this point. 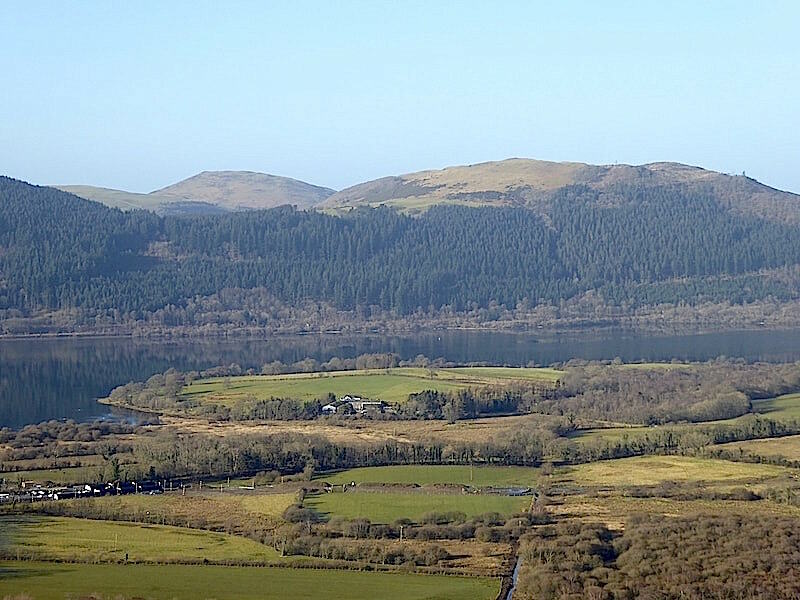 On the centre right of the skyline are Ling Fell and Sale How while the high point to the left is Broom Fell. 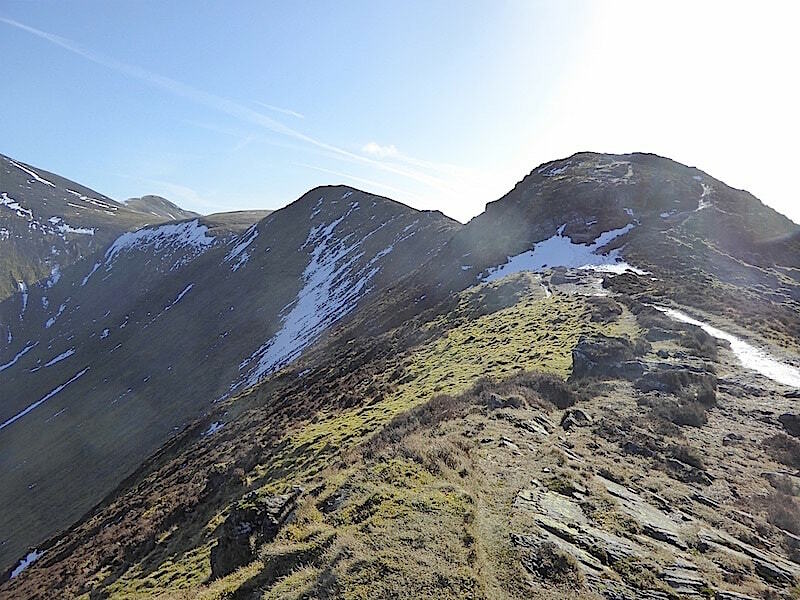 A close up of Ling Fell and Sale Fell while I’m waiting for the gps to sort itself out and the frustration to dissipate. We get there eventually and set off again across the slopes of Ling How and finally reach …..
….. the small depression between Watches and Ling How from where we can just see Great Cockup on the distant skyline …..
….. while behind us more of Bass Lake has come into view. From the depression we take a right turn, face straight into the sun, and begin the climb over Ling How and on towards The Edge. The climb begins gently enough but little by little it steepens and the view of Bass Lake opens up a little further. Its much too hazy for any views over the Solway Firth though. 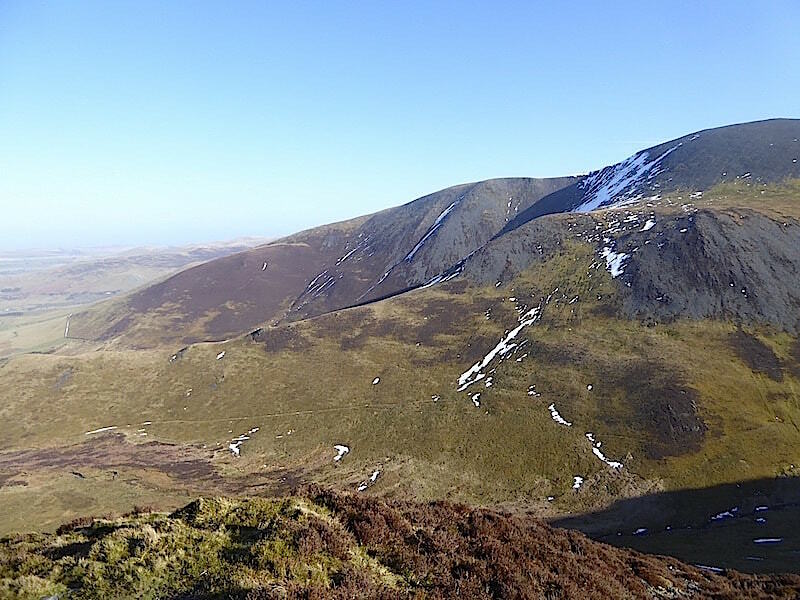 The Skiddaw massif appears across Southerndale on our left. 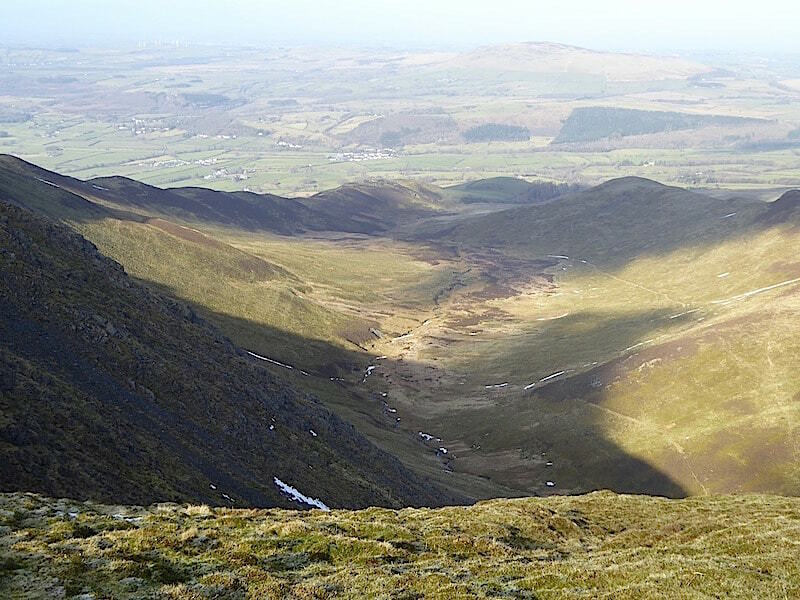 On the left of the skyline is Bakestall, followed by Broad End and then the long, flat plateau of Skiddaw. 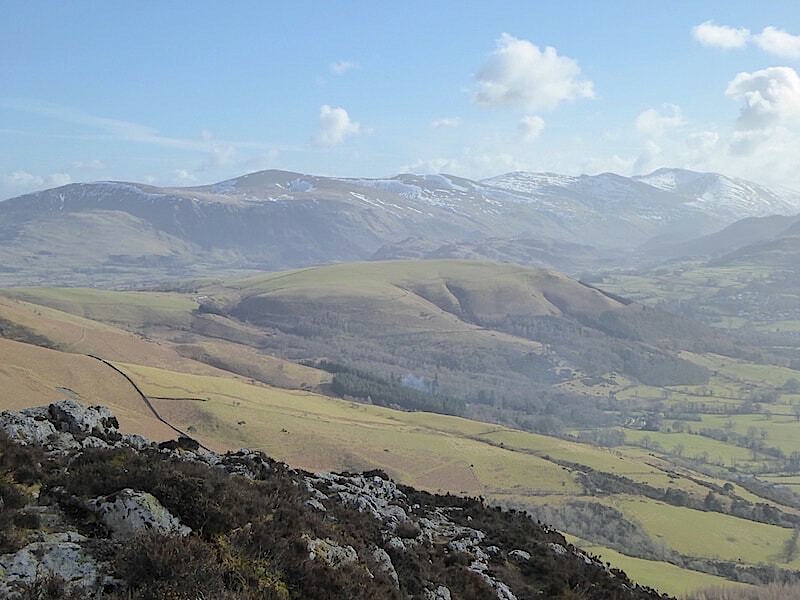 The long ridge below them is Randel Crag which separates the valleys of Southerndale on this side and Barkbethdale on the other side. A look back down at the ridge line path as we reach the last rise before the false summit. We had a coffee break at this point while watching the progress of the three walkers below us. We had noticed them some time earlier as they were walking across the open fellside path alongside Dyke Nook plantation. 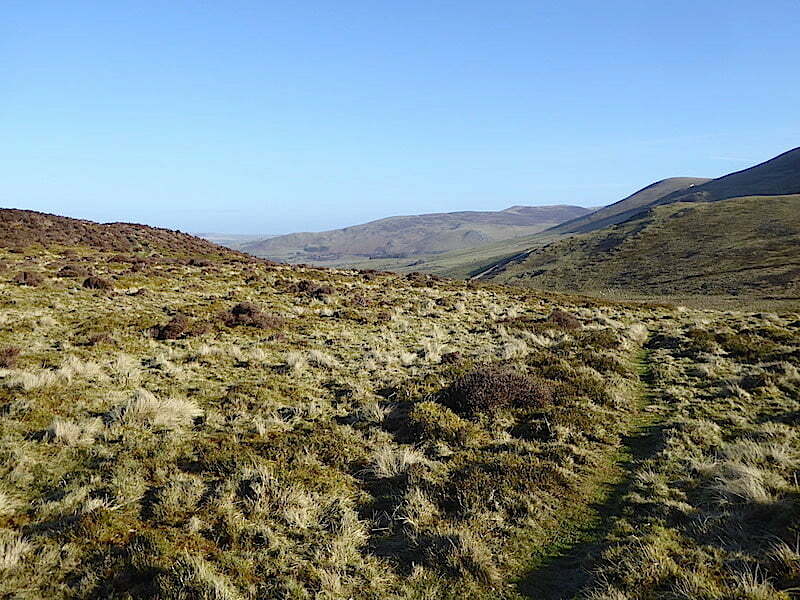 We originally thought there were just two walkers but as you can see there are three, the last one of whom is sitting down alongside the path and taking a breather. The front two walkers came alongside us just as we were about to get going again and had a chat with us whilst waiting for their older companion. They mentioned that he had hip problems so he had to go at his own pace and therefore wasn’t able to keep up with them. The two of them usually walk on ahead and then stop and wait for him to catch up. I had been wondering why they never seemed to get any closer to us especially as we weren’t walking very quickly. 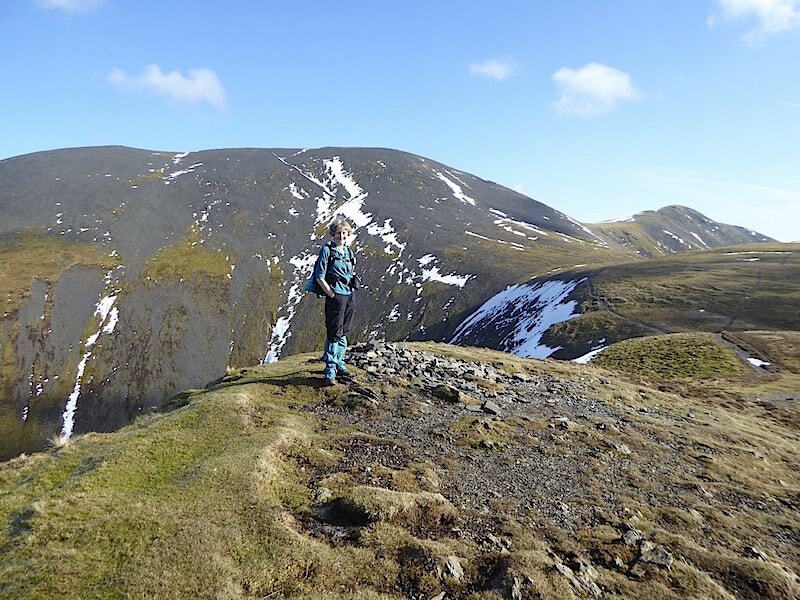 On we go again, along The Edge, with a view across to the head of Southerndale and the great bulk of Skiddaw rising above it …..
….. and a look to the left where Bakestall drops gracefully down to valley level and the Cumbria Way route. 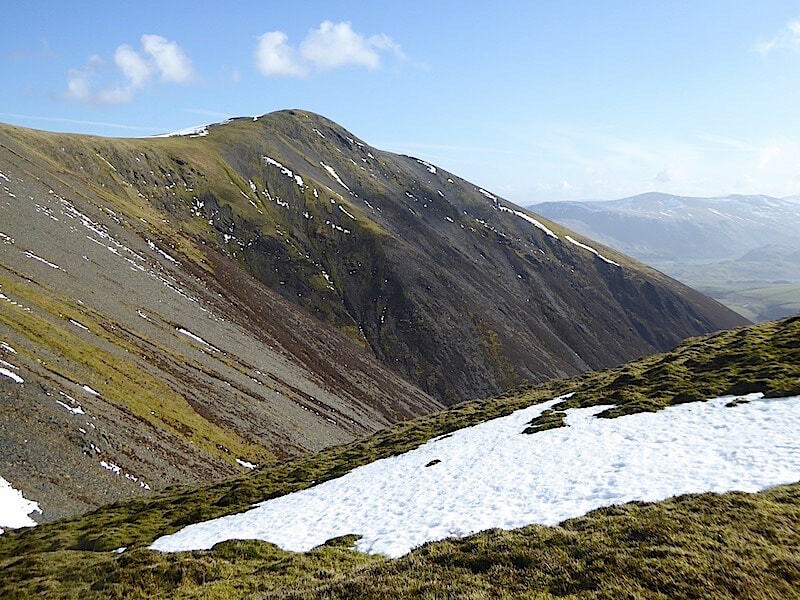 Just below the peak of the false summit and above the head of Southerndale the summit of Skiddaw Little Man pops up on the centre skyline above the col between Carl Side and Skiddaw. 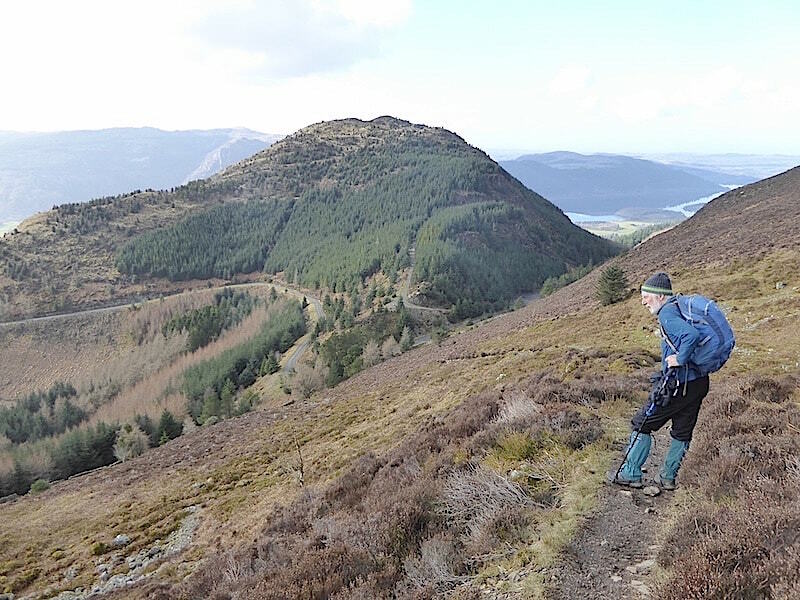 We finally gain the flatter area on the false top and enjoy a brief spell of level walking, for which our legs are duly thankful, before the final section of climbing up to the actual summit of Ullock Pike, immediately ahead of us on the right. 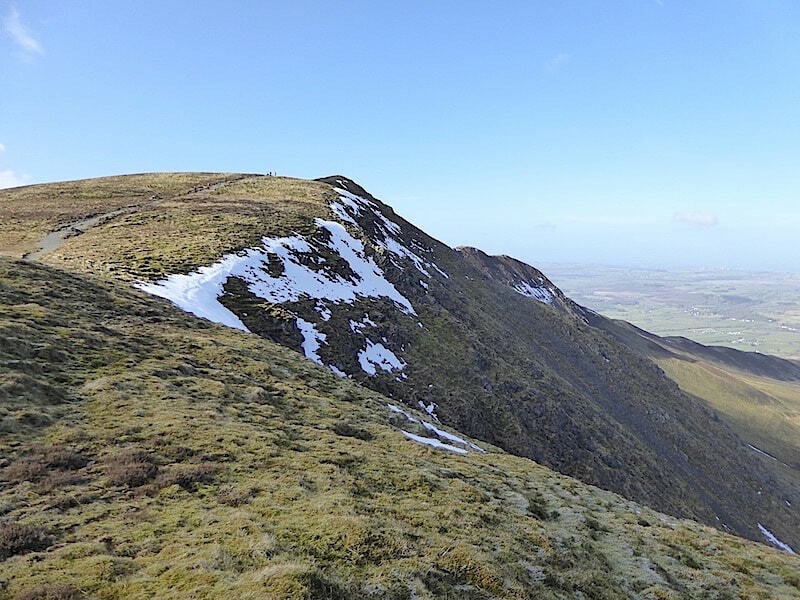 To the left of it is Long Side and beyond that the flatter summit of Carl Side. 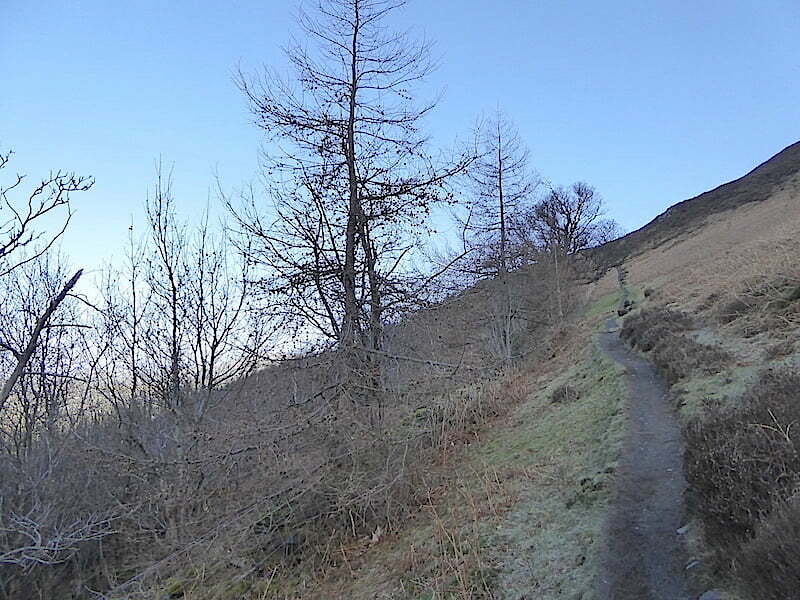 All the snow drifts across the paths on the way up were deep and frozen rock hard but easily avoided so it wasn’t worth bothering with the spikes. 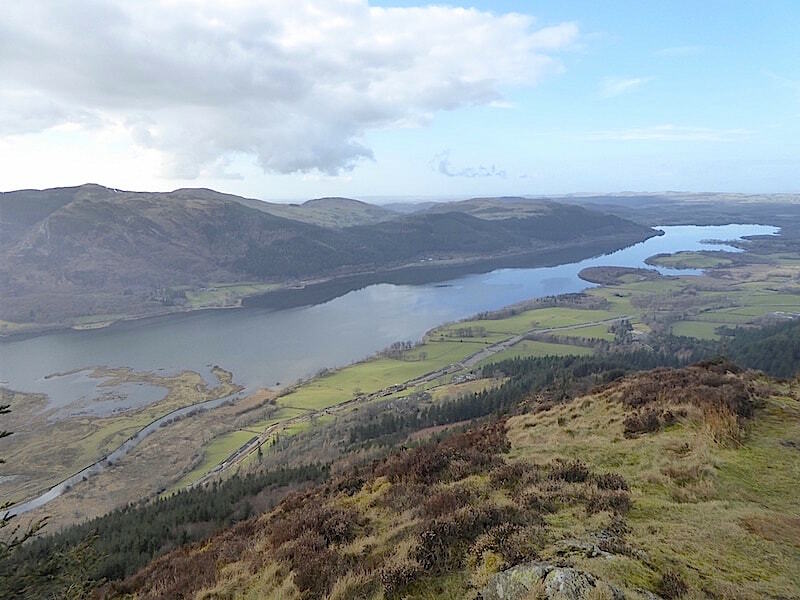 The view across Derwentwater from Ullock Pike summit. Its a lovely day but the haze does nothing for the views. We have the summit to ourselves as the three man group are still making their way up the false top some distance behind us. 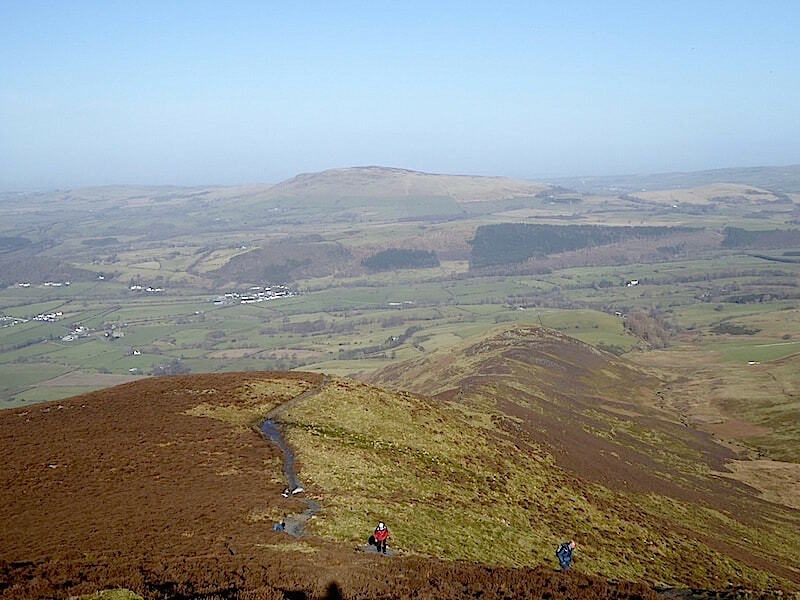 There are small groups of walkers heading over Longside Edge, all of whom had passed by us earlier when we stopped for our coffee break. Warm enough not to need to put our jackets back on, and hardly a breath of wind, as we take in the views from Ullock Pike before walking along to Long Side. 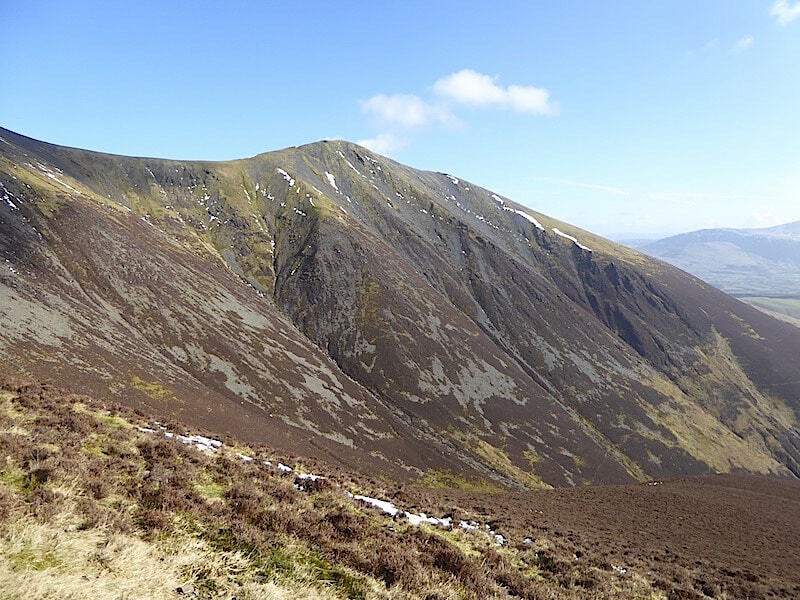 From Longside Edge a look back at Ullock Pike where the three man group has just arrived on the summit, along with a couple of others by the look of it. 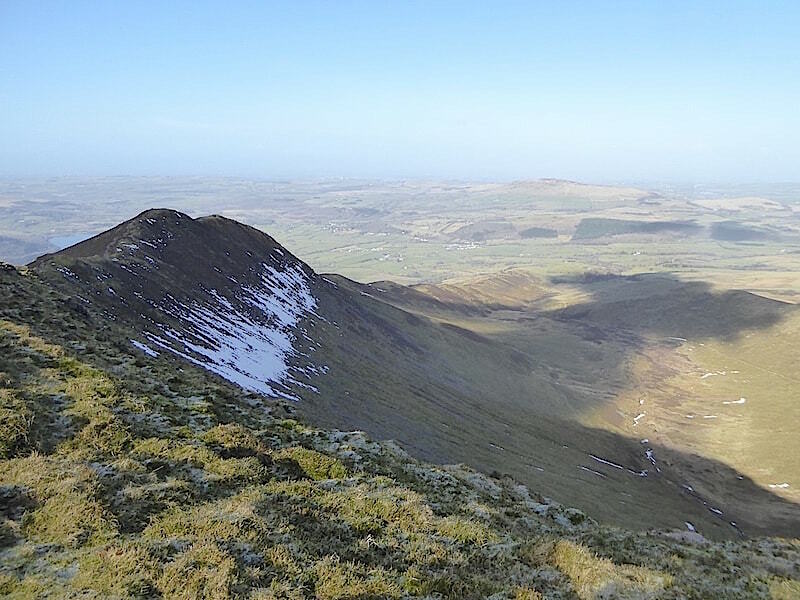 The false summit is just visible behind the actual summit. 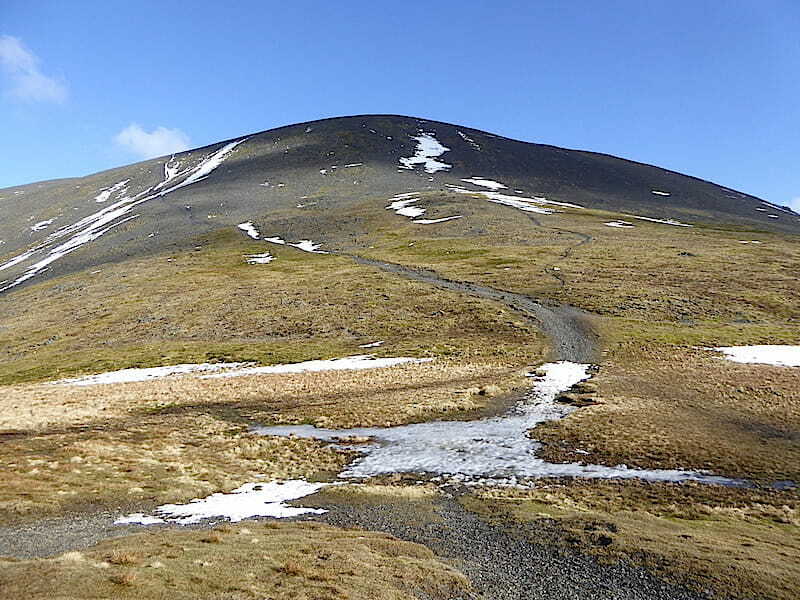 This heap of stones marks the summit of Long Side from where we will drop down and make our way over to Carl Side. 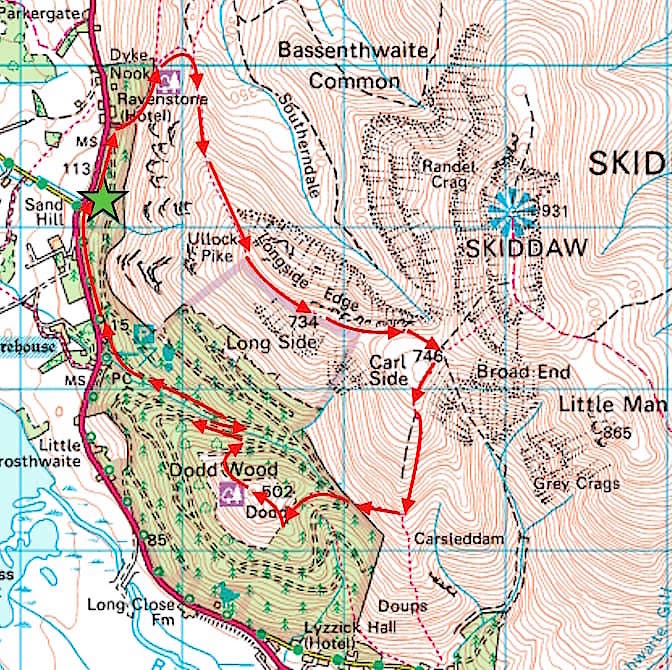 As can be seen the path splits a little further along, the left hand route follows the edge, with some fine views along Southerndale, and onwards to Carlside Col, the right hand one goes directly across to the summit cairn. We’ll take the left hand path to take advantage of the views. 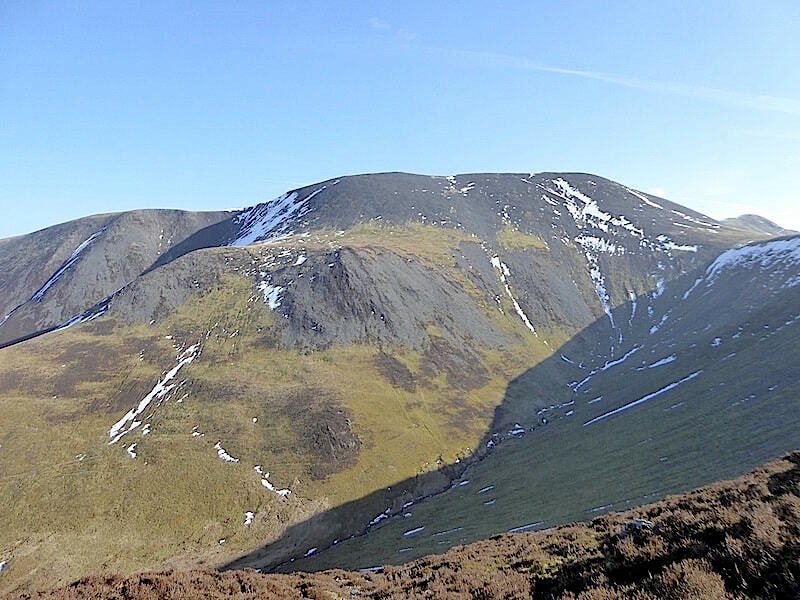 From Long Side a look back towards Ullock Pike and a view down Southerndale. Binsey is almost indistinct on the distant skyline as we enjoy the spectacular view along Southerndale. 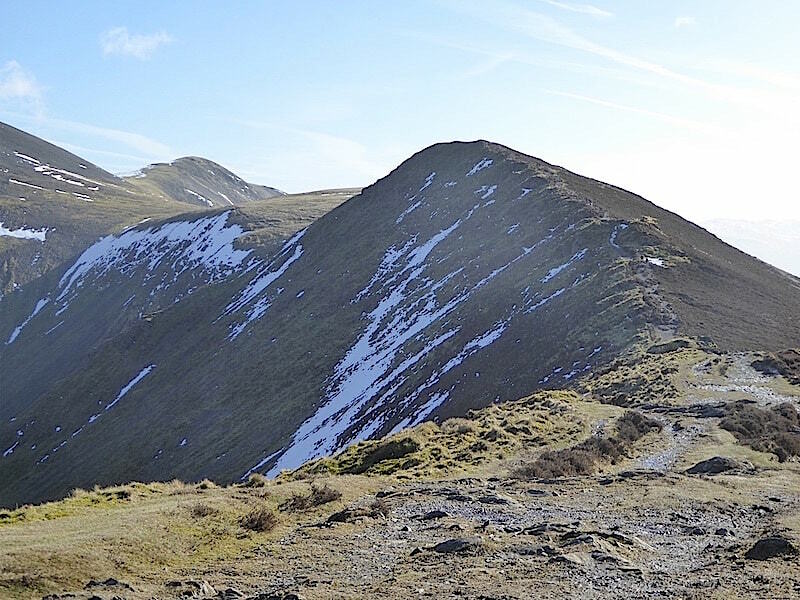 The long ridge in shadow on the left in the middle foreground is the one leading up to Ullock Pike. Yours truly enjoying the sunshine on Long Side. 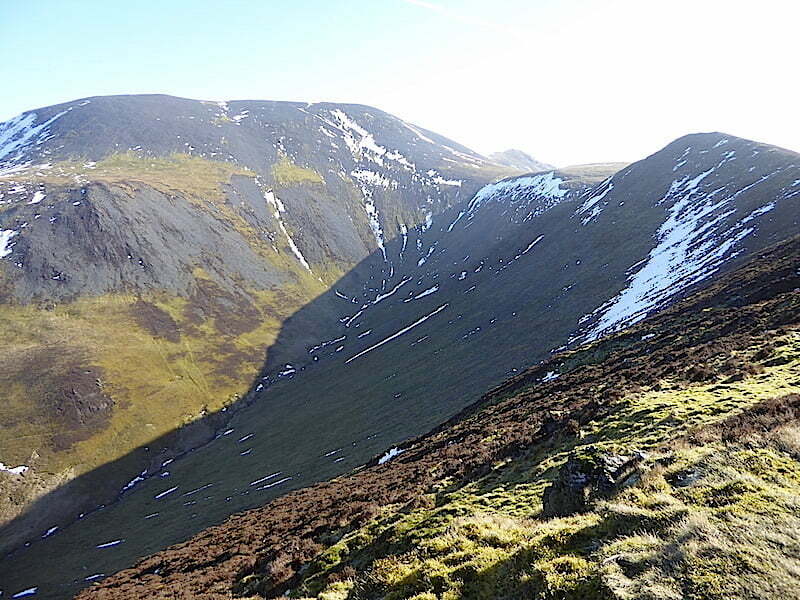 Looking back to Longside Edge where the three man group has just popped up over the crest of the hill. The first walker of the three man group arrives as we leave the views of Southerndale and begin to make our way over to Carl Side. He’s also taking in the views while he waits for the other two to catch up with him. Doesn’t look as though it will be too long before they do as there’s no-one visible on the path coming down from Long Side. 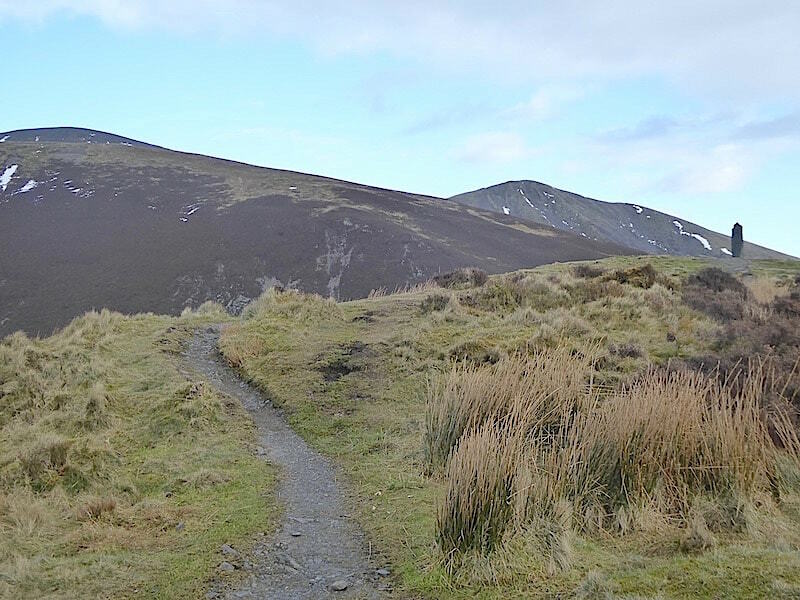 Carlside Col where a couple of paths rise on the left up the steep scree slopes of Skiddaw. 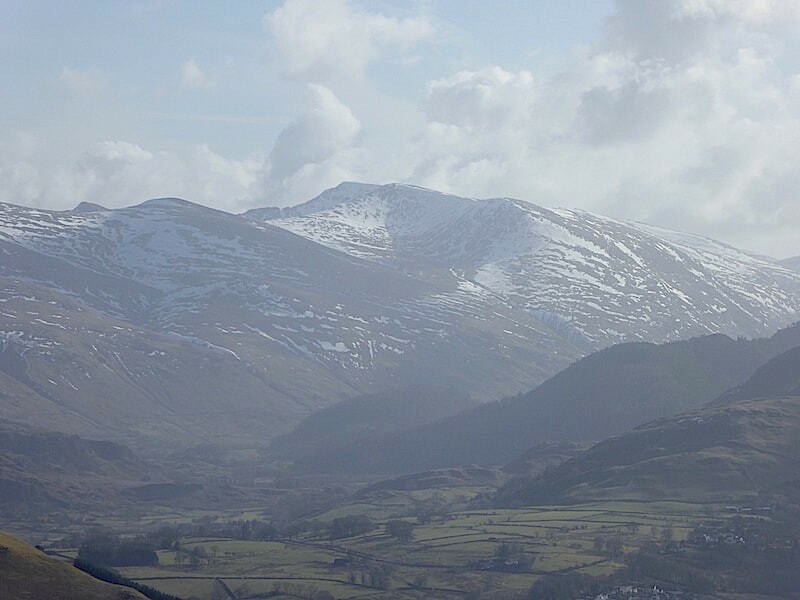 On the right skyline is Skiddaw’s little brother, Skiddaw Little Man. 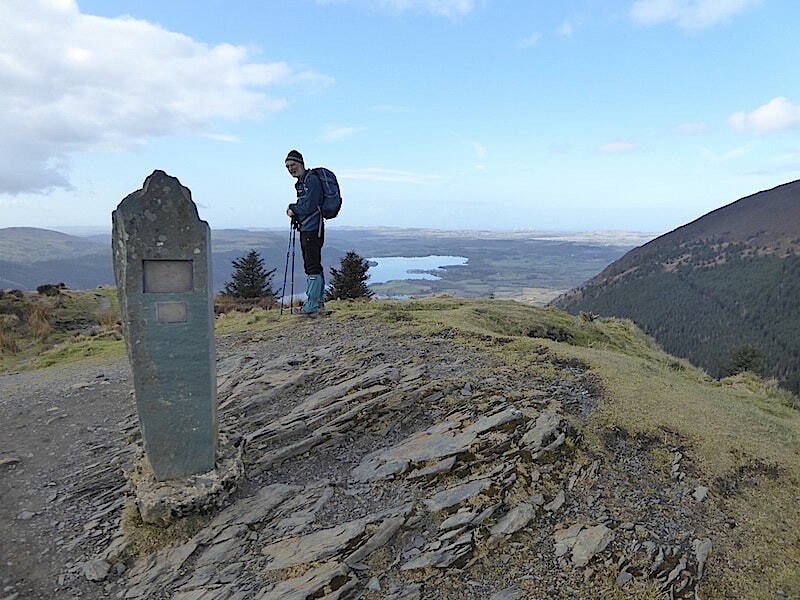 We had considered going up Skiddaw and returning via Broad End but it just wasn’t something I was up to tackling today so we gave it a miss and headed off on the right hand path and up to the summit cairn on Carl Side. Just off to the left the three man group have gathered around their map. 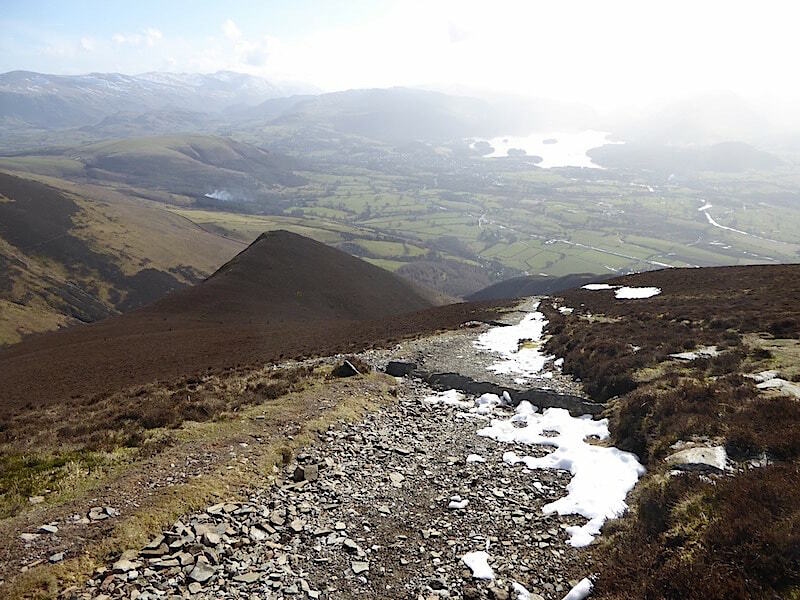 They had already told us that they were planning to climb Skiddaw but as one of them hated scree slopes and another one had a bad hip they were hoping to find a route across which would be acceptable to all. They eventually chose the path going off to the right where the main path begins to curve left. 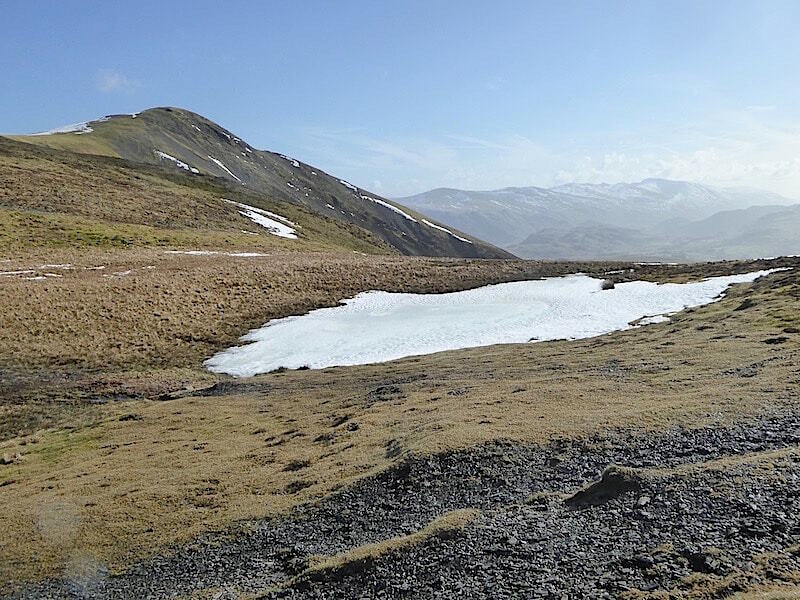 We continue up to Carl Side summit passing by the little tarn which is still snow covered and frozen solid. 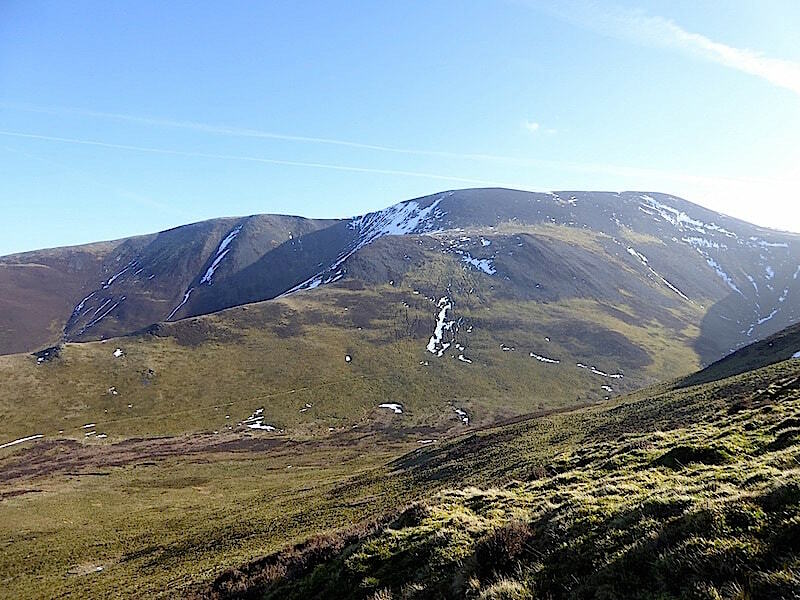 A ringside view of Skiddaw Little Man from the slopes of Carl Side, we haven’t been over there for a quite a while too. 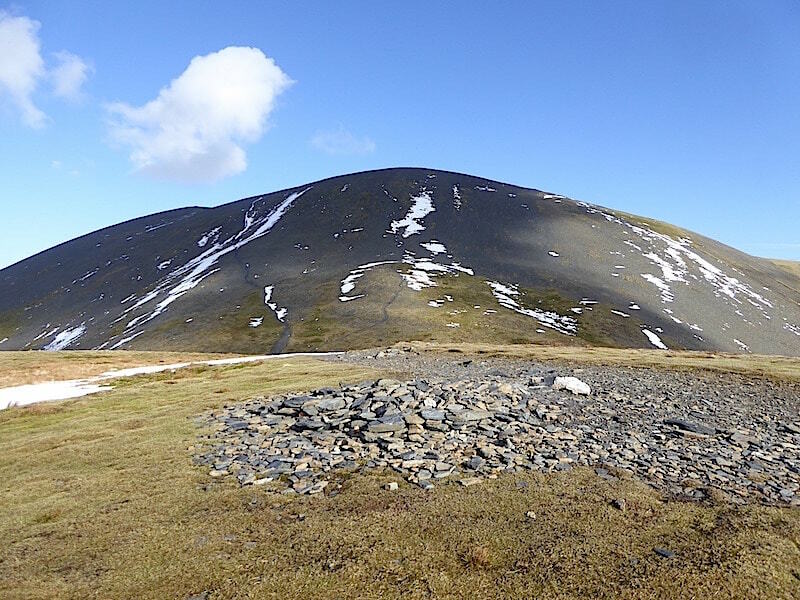 The pile of stones marking the summit of Carl Side from where I took a look back at Skiddaw. We could just make out the three man group, now well strung out again and steadily plodding their way up the central path but its hard to pick them out in the shot. 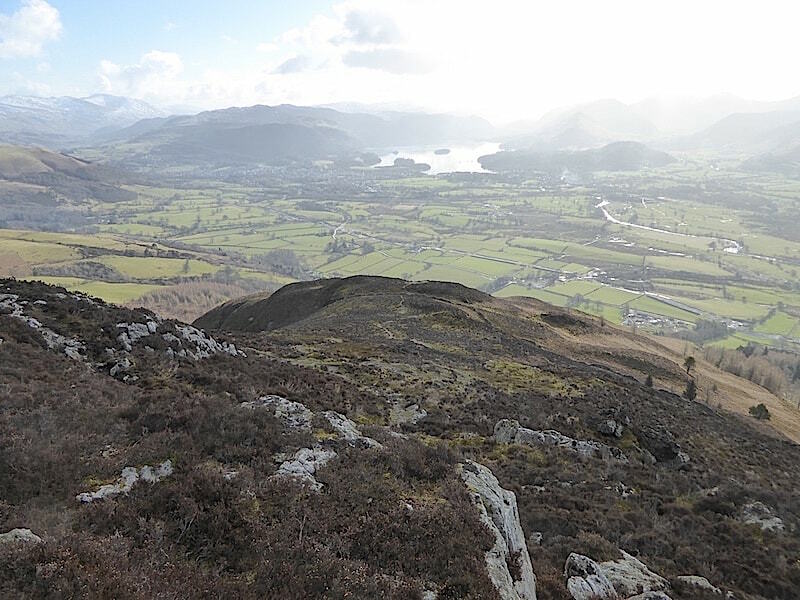 Bright sunlight putting a gleam on Derwentwater and the general haze putting an end to any clear views as we make our way off Carl Side down the steep and shaley path. Beyond the dark peak of Carlsleddam a bonfire has just been lit and the smell of the wood smoke is already reaching us. 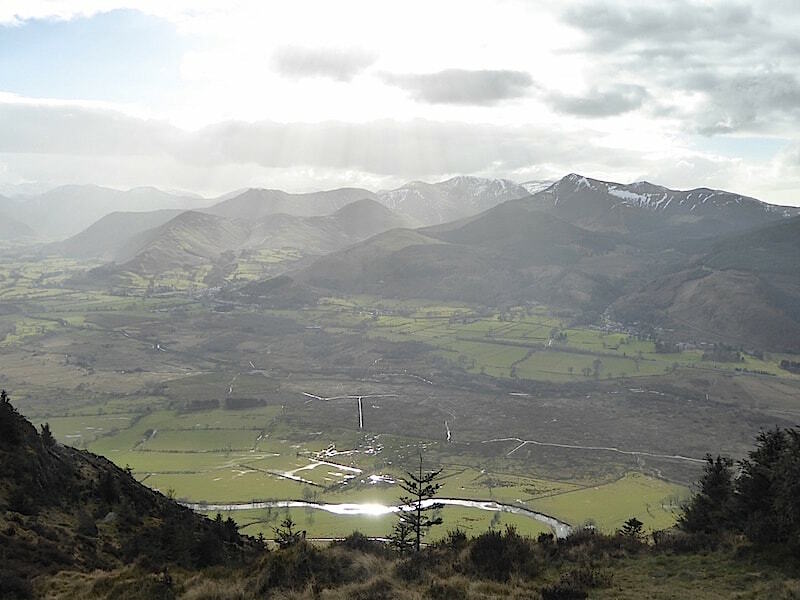 Another grandstand view of Skiddaw Little Man from the descent. We reach White Stones and find a suitable perch on which to sit and enjoy a short break for a minute or two. 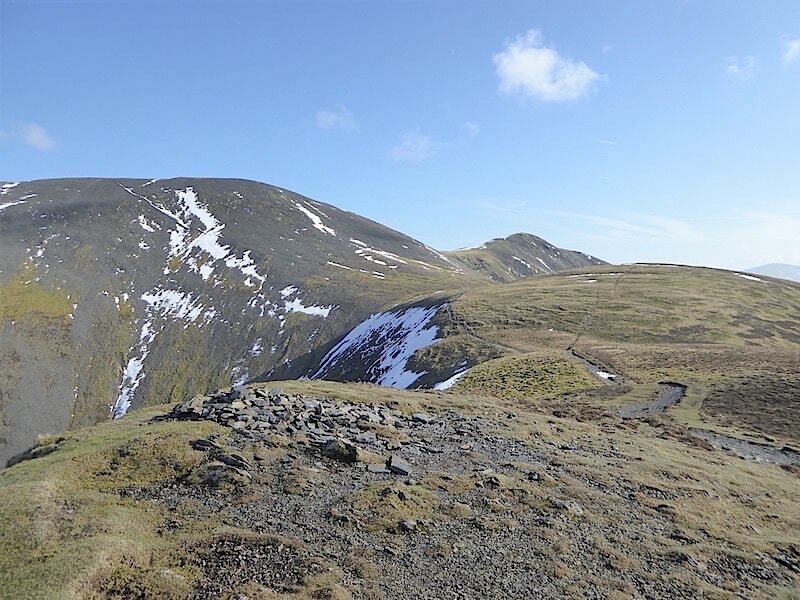 From our White Stones vantage point we have a reasonable view of Clough Head, the Dodds and Helvellyn over to the south east, with the flattened grassy mound of Latrigg below them. The wood smoke still rising from the small plantation below it. 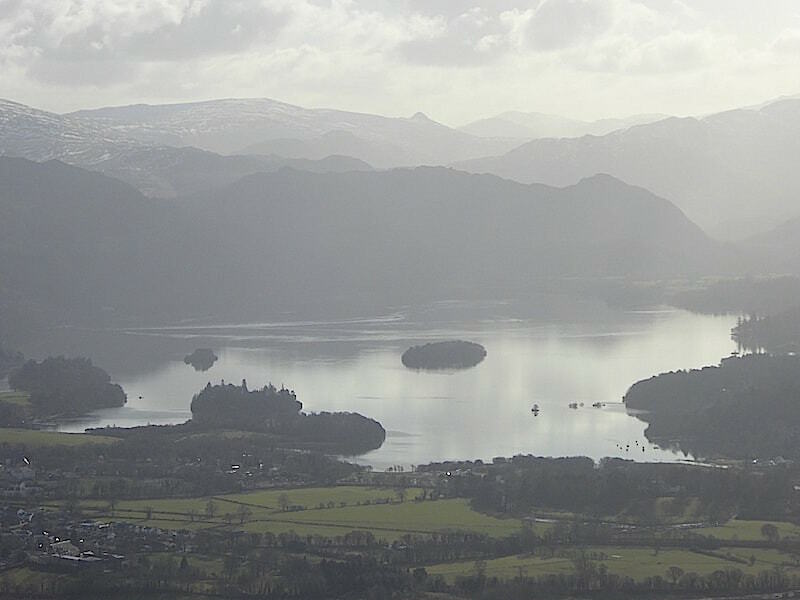 Helvellyn in close up …..
….. and likewise for a misty moody Derwentwater. 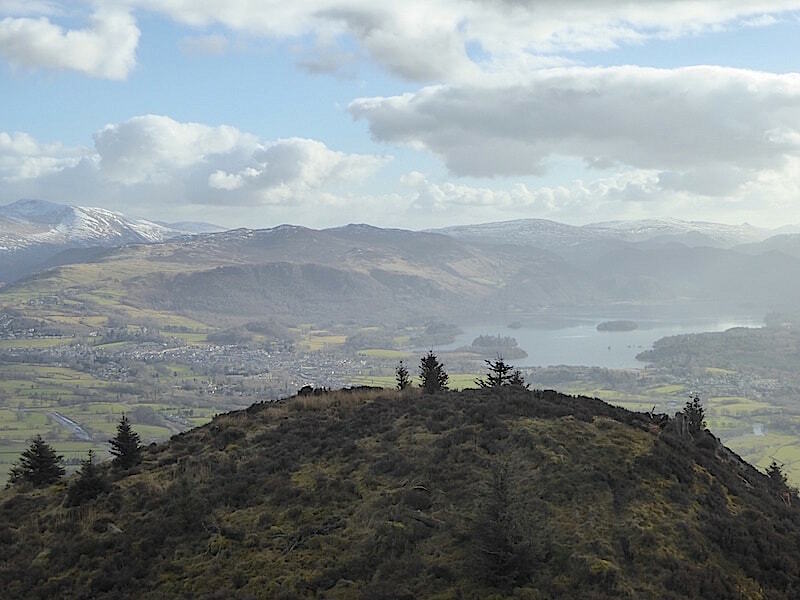 Looking down over Doups, the smaller hill below us, across the vale of Keswick to Derwentwater, a marvellous viewpoint and even better when there’s no haze. 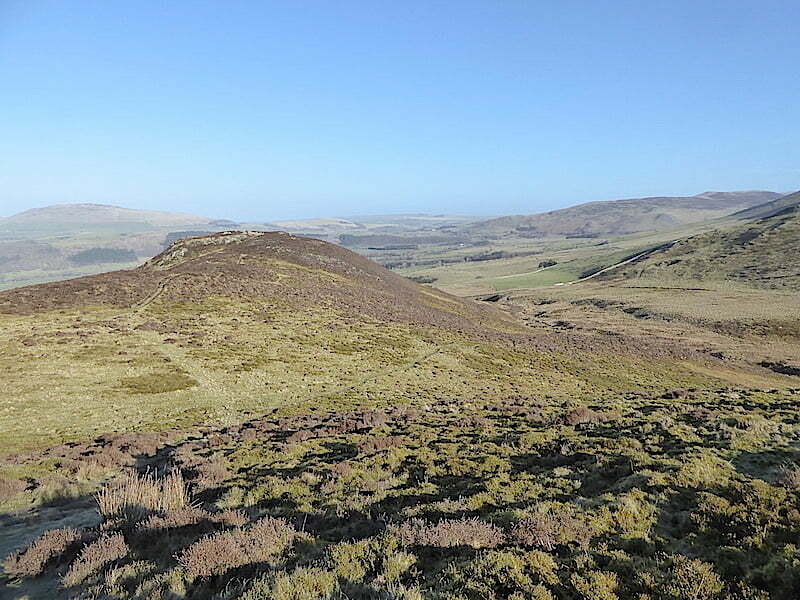 With some reluctance we leave our White Stones viewpoint and head along the path to the cairn marking the path junction. 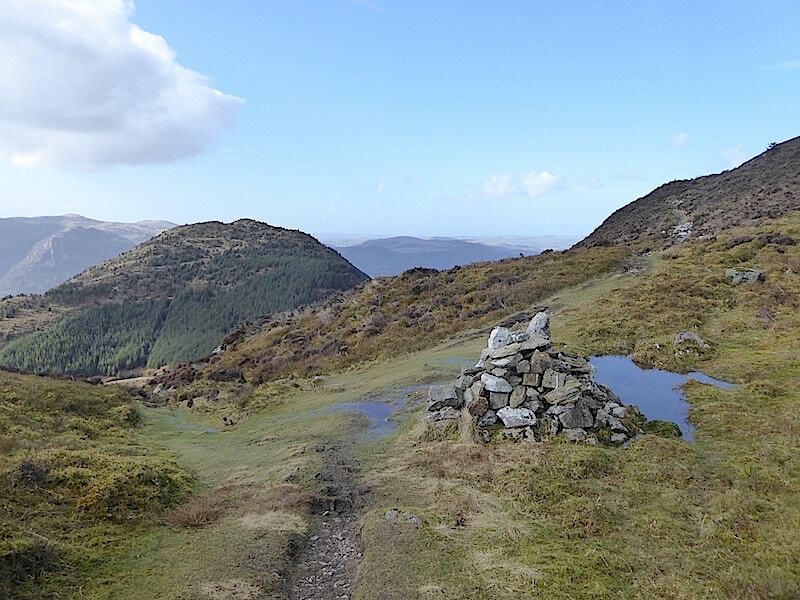 The path above, and to the right of the cairn, also comes down from Carl Side summit. It takes more of a zig-zag line and is much easier to deal with than the straight up and down one we have just descended. At the junction we take a left turn and make our way down the slope to the forest road. 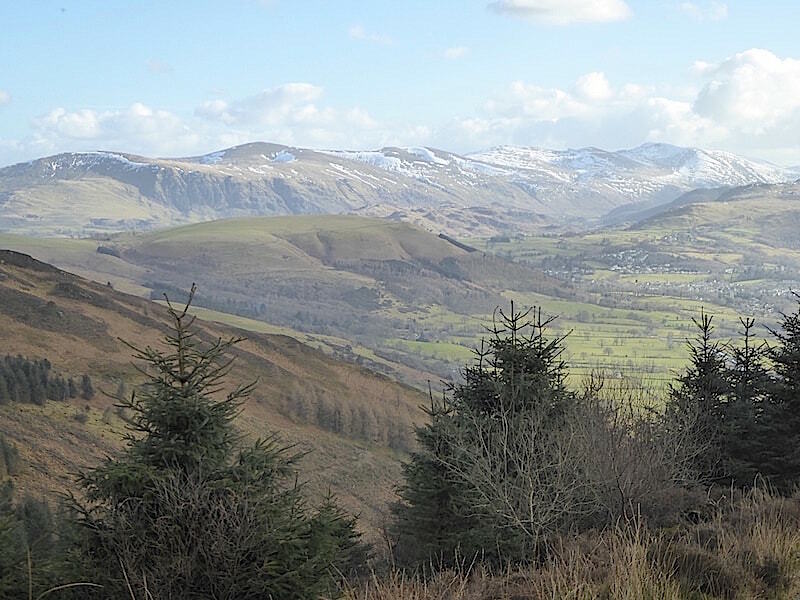 Below us is Dodd Fell, the next fell on our walk, but before we go up to the summit we plan to walk the short way up to the first bench seat, get the lunch boxes out and have a short refuelling stop. 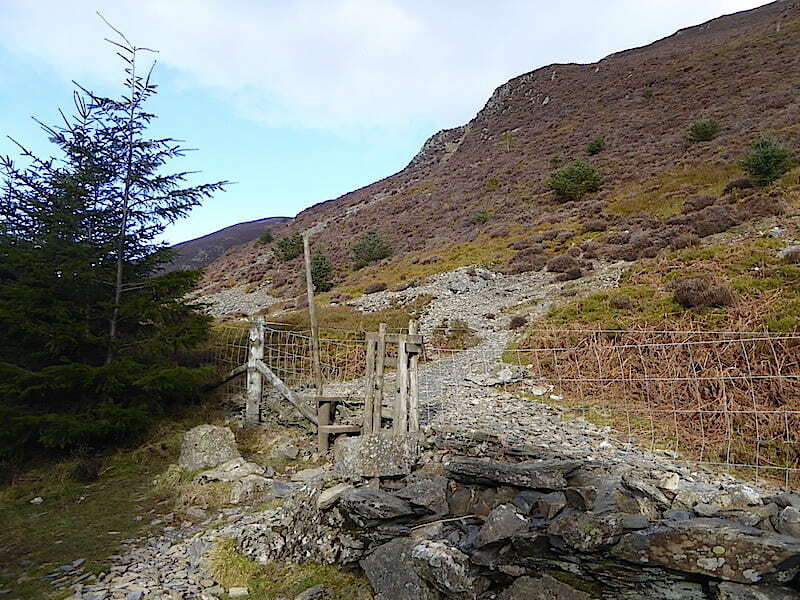 Over the stile at the end of the path and back on the metalled forest road. 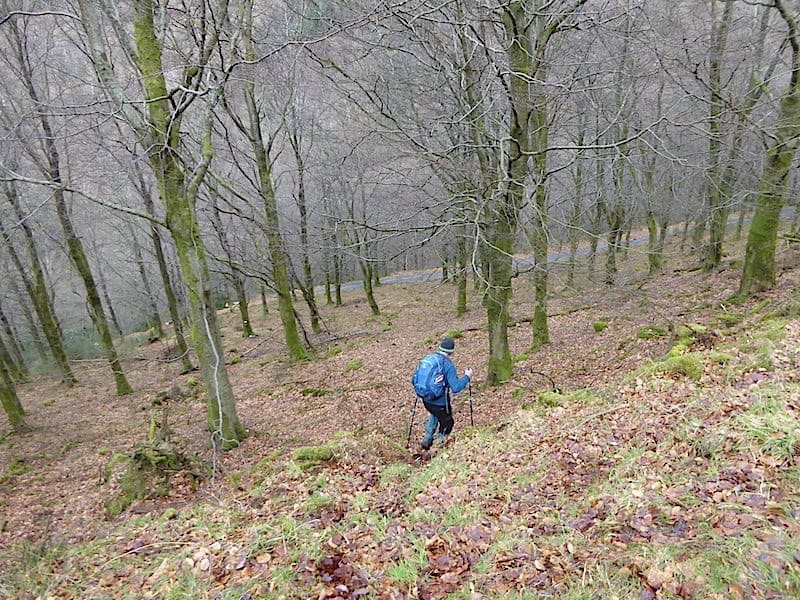 Its great to be able to take the brakes off and walk easily again after negotiating the loose and slithery descent path. 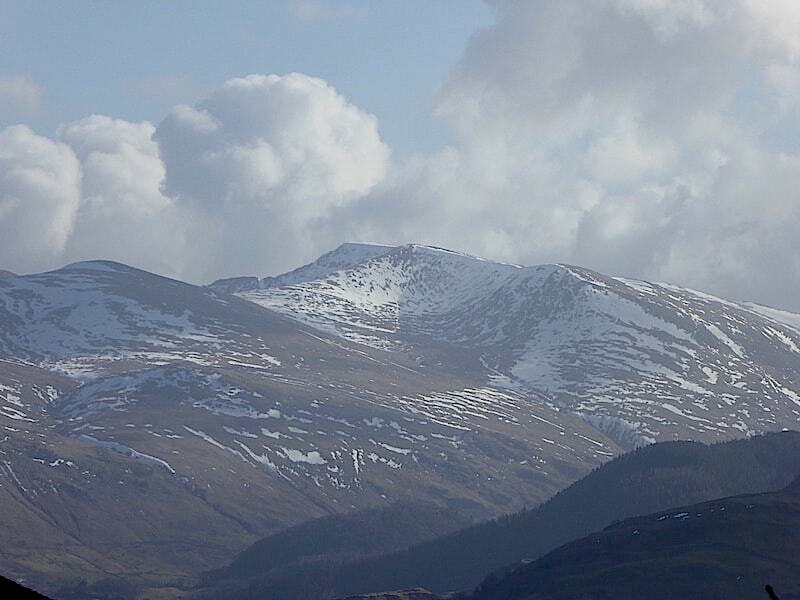 From the lunch bench another close up of Helvellyn with some large and dramatic clouds building above it …..
….. and a longer view of our lunch break panorama. 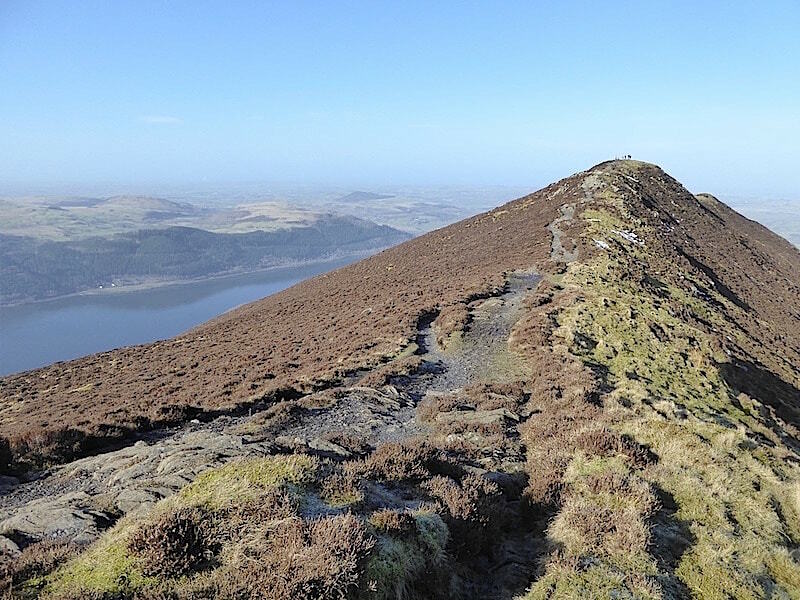 Lunch break over and with everything stowed in our packs again off we go up the laid path to the summit of Dodd. 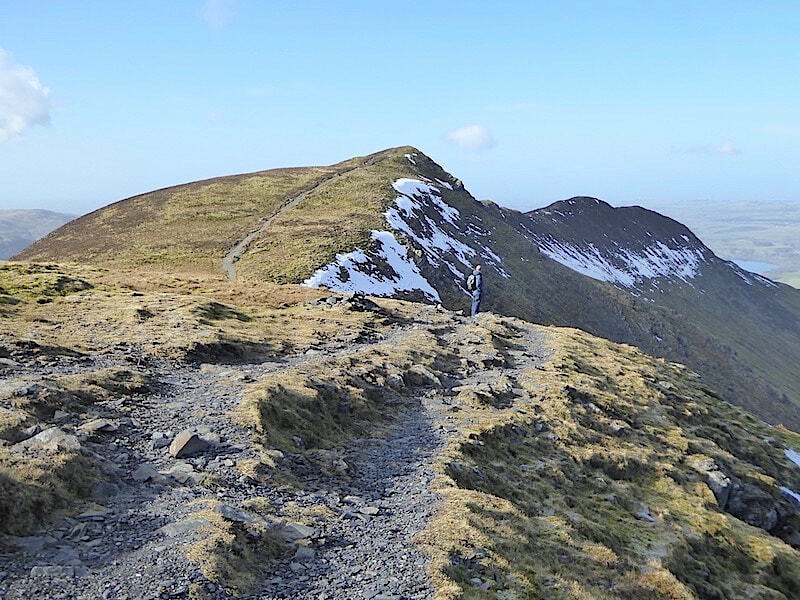 One of the solo walkers who passed by us as we were having our coffee break below Ullock Pike has just passed us on his way down from Dodd summit. We were surprised to see him again as we thought he would have been long gone by now. 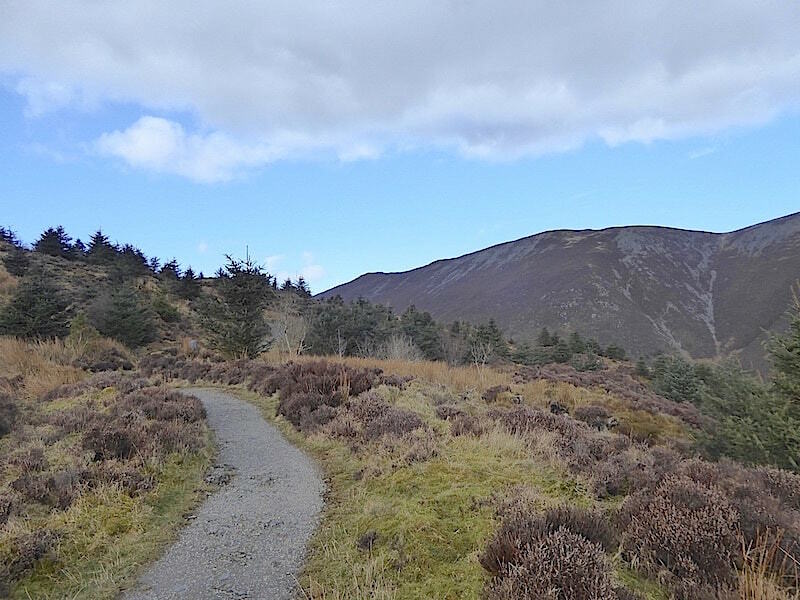 On the skyline we have a view of Ullock Pike and Long Side, part of the outward leg of today’s walk, and above us a large swathe of cloud has drifted across. 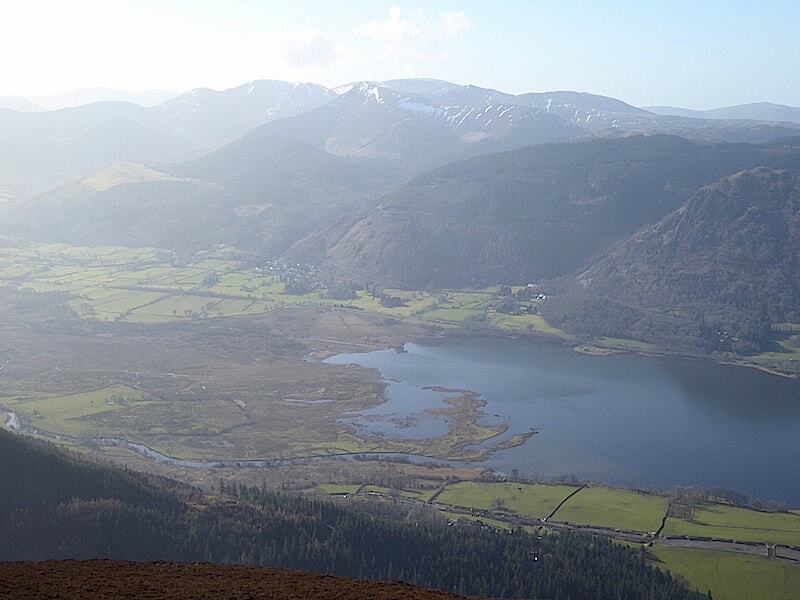 The sun glints on the River Derwent below and the increased cloud cover gives us a slightly better view of Grisedale Pike and its hazy neighbours than we’ve had so far today. The cloud continues to build as we carry on up to the summit. Dodd summit with a glimpse of Bass Lake beyond it. A lovely view of Bass Lake from Dodd summit. A bit of sunshine would have helped but the bank of cloud above us was very slow moving and continued to build so that was pretty much the end of the sunshine for the rest of the walk. 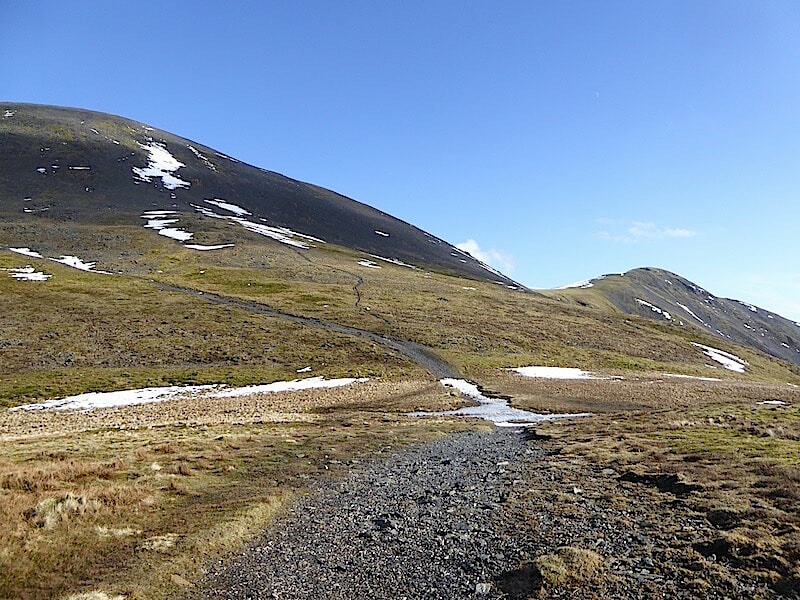 A look back at Carl Side and Skiddaw as we start to descend. 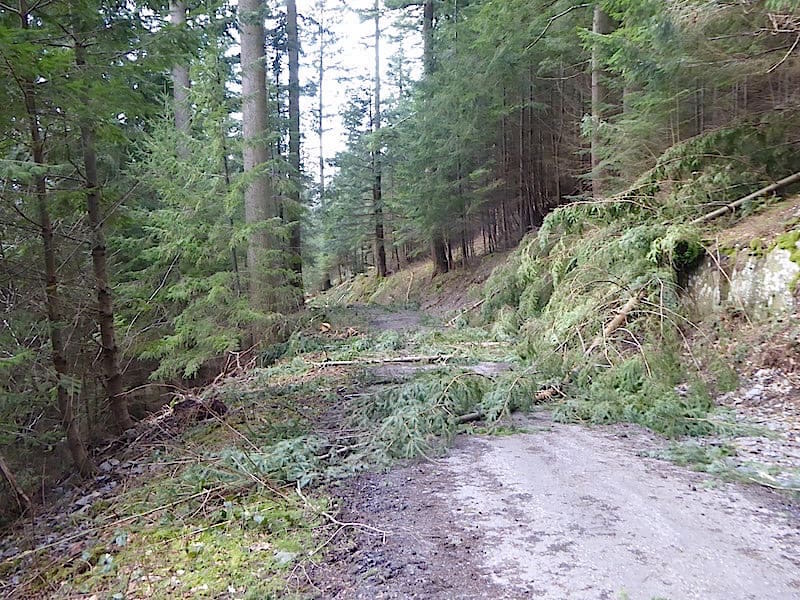 A look back up the forest trail as we continue the descent …..
….. and, being lazy so and so’s, we cut the corner off and drop down through the woodland to the lower forest road …..
….. where evidence of logging operations meets us. 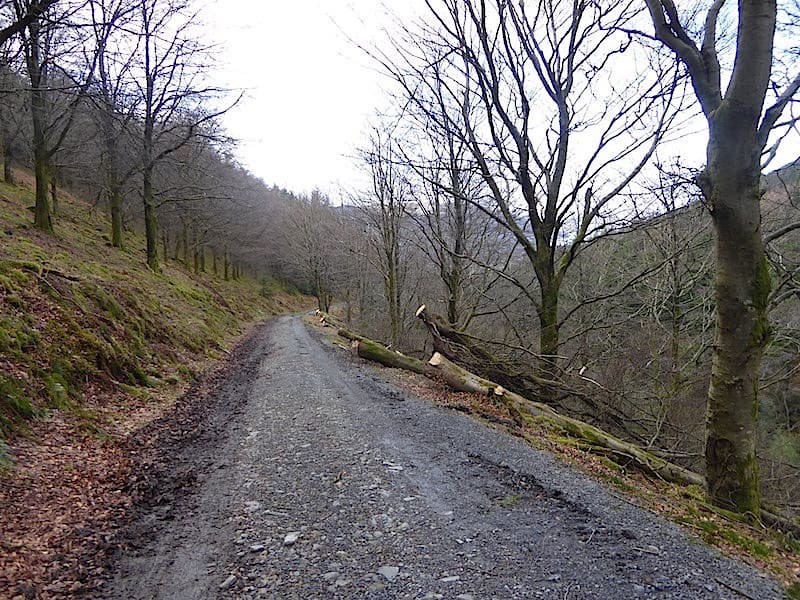 Further along as we rounded the bend we came across two parked vehicles straddling the road, beyond which felled trees completely covered the track with heavy forestry machinery busily felling more. 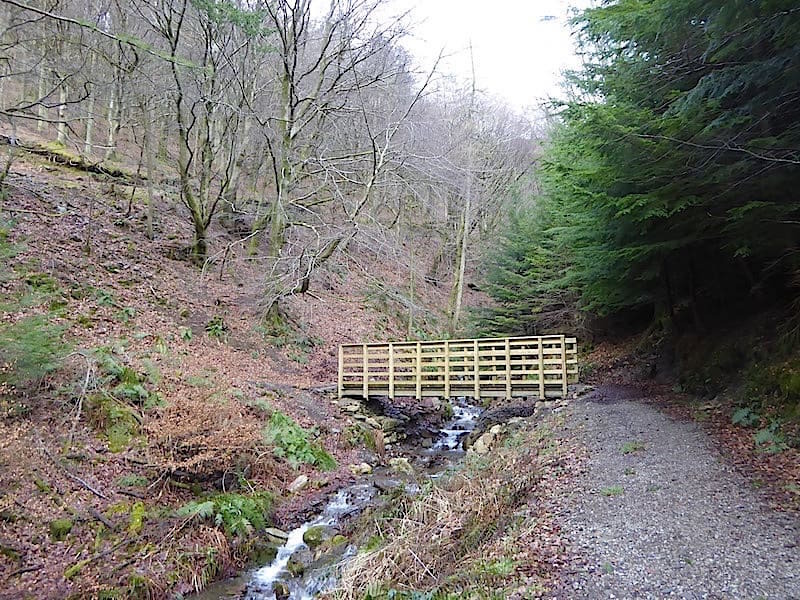 We retraced our steps to a path junction and followed the path down to Skill Beck …..
….. which in turn had us doubling back along this path to this new bridge which replaces the previous one destroyed during Storm Desmond in 2015. Across the bridge and up the opposite slope where the exit was blocked by a sign. We squeezed around the sign and saw that it stated that the trail was closed due to felling operations. We weren’t about to go all the way back up so we continued down the Skill Beck route picking our way over the debris left after the logging activity on this side of the beck …..
….. even more debris lying around as we reach the path leading off to the left and down to the Old Saw Mill tea rooms. We aren’t parked in that car park so we continue on round the bend to the right and exit through the single bar gate at the end, this was also covered with notices about trail closures and logging operations. Having exited via the gate we continue on the Sandbeds Gill trail. We were not expecting this completely bare trail at all. 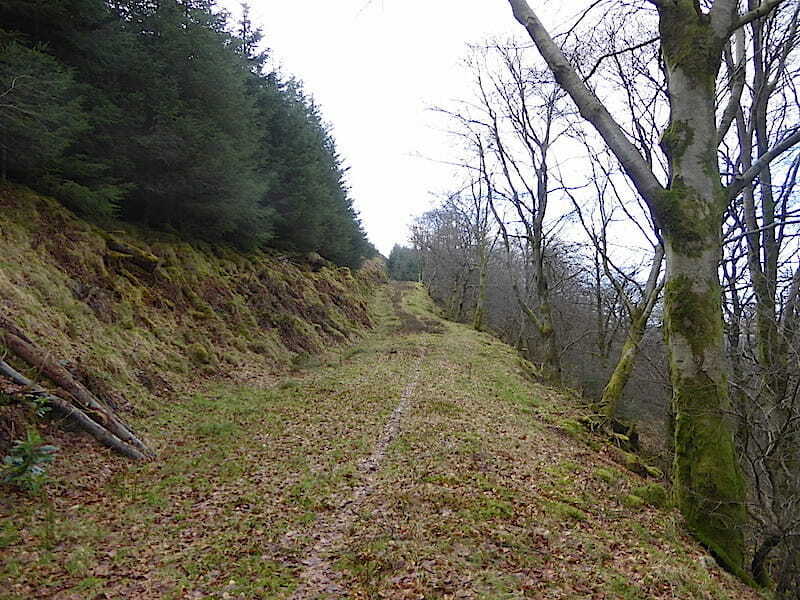 When we last walked along here in 2015 there were trees and shrubs alongside us and we had almost no view of the road which provided a quiet and relatively peaceful walk all the way back to the lay-by. 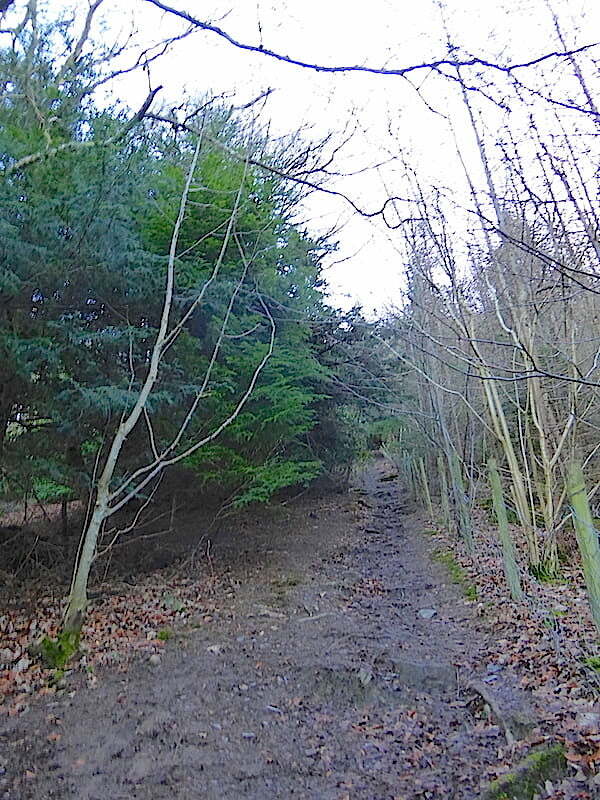 I expect there will be a good reason for all the felling but it no longer feels like a woodland walk, its now nothing more than an elevated pavement. 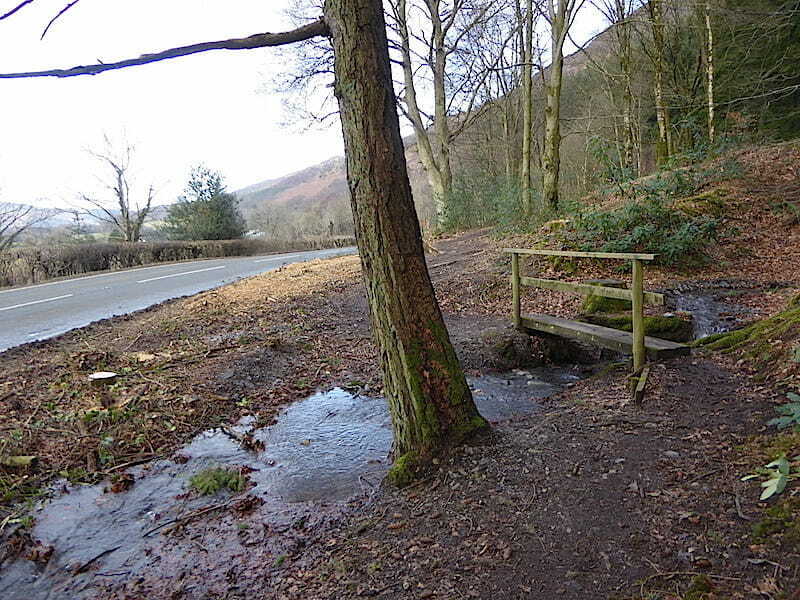 Another surprise when we reach the little bridge across Sandbeds Gill, which now has a totally different appearance. 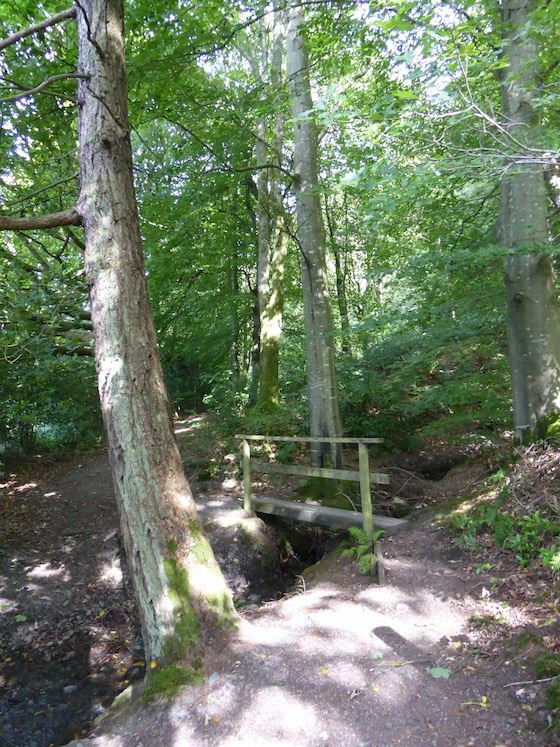 Here’s what it looked like in 2015 …..
….. the pleasant winding stroll through the lovely secluded woodland has been severely diminished. 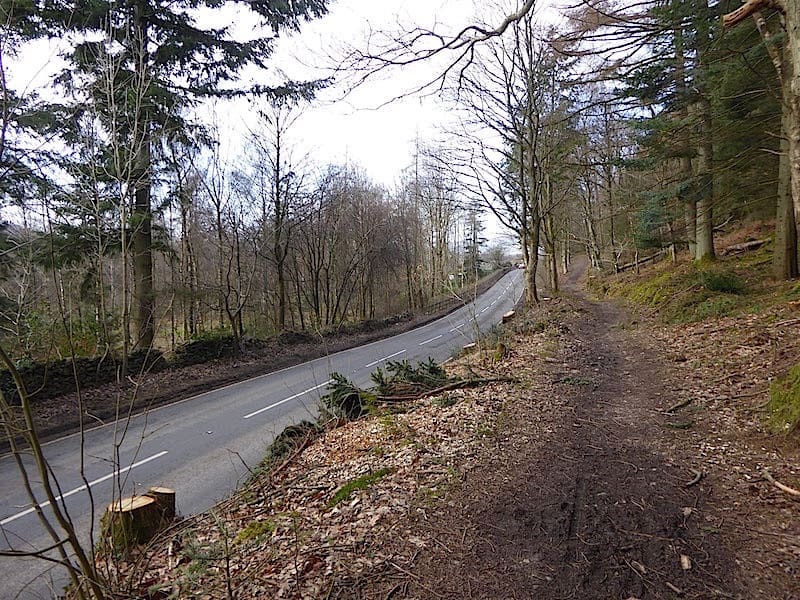 In 2015 it was impossible to see the lay-by just a few yards ahead. Today after crossing the bridge and rounding the bend the lay-by was in clear view all the way along the now very open trail. Oh well, that’s progress I suppose. 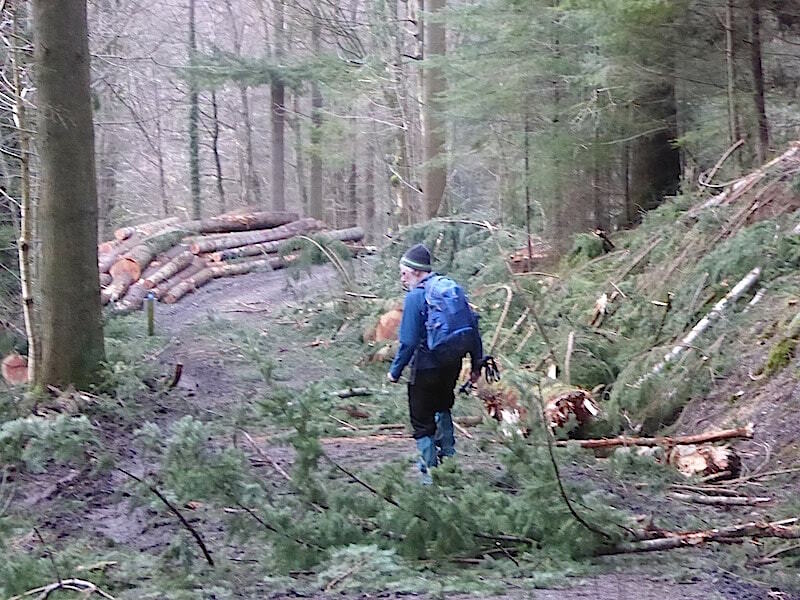 I checked the Forestry Commission web site for more information and found that all trails are closed for the time being, I couldn’t find any indication of when they would be open again. By way of compensation, I suppose, the tea room is open, as is the car park where parking is currently free due to the disruption.